Experts debate whether the devastating weather activity across the US in the past 12 months are a byproduct of global warming or an unfortunate string of coincidental natural disasters. The truth is, we can always point to multiple years where above average climatic activity has spurned nearly continuous tornado outbreaks, brutal Nor'easter events, back-to-back hurricane devastation, and torrential rain and wind that result in flooding and unstable ground conditions. In the aftermath of damaging storms many laborers, tradesmen, and arborists are called upon to begin recovery operations - exerting continuous manpower hours dismantling unstable trees, cutting and removing fallen trees and branches, locating and securing downed power lines, and re-opening roadways to resume business and residential access. An unfortunate part of the storm cleanup process is the number of employee injuries and on-the-job fatalities that occur. The Bureau of Labor Statistics (BLS) ranks the tree service/logging industry as the #1 most dangerous job in the nation with 135.9 fatal injuries per 100,000 workers in 2016. The bureau also lists falls/slips/and trips as the third leading cause of injuries in the workplace. This is especially true for the tree service industry. The chances of injury or fatality attributed to tree trimming and tree removal during a normal work day are exacerbated in the aftermath of a major weather event that has left a path of destruction. After the high winds and floodwaters caused by Hurricane Katrina and Rita, extensive damage to trees caused OSHA to release an updated Hazard Exposure and Risk Assessment Matrix for Hurricane Response and Recovery Work, with specific emphasis on tree trimming. The current process of dismantling damaged and structurally unsafe trees in the aftermath of a major weather event allow many opportunities for mistakes that cause injury or death. Traditional methods require a climber-arborist to set up a system of pulleys and ropes for controlling and guiding tree sections to the ground after they are cut by chainsaw from the tree. Using hand or chain saws, along with ladders or a man-basket, all branches from bottom up are removed. 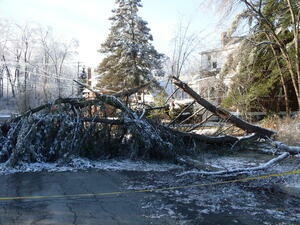 The old method of storm cleanup with tree removal is labor intensive and exposes tree care workers to falling trees, electrical power lines and dangerous heights. As workers are overcome with fatigue, they are at a greater risk of being negligent. 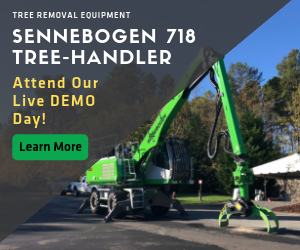 Consider another solution - one that can save lives and get storm-ravaged areas cleaned up faster and safer - the SENNEBOGEN 718M E series. SENNEBOGEN has added a new product to its line of logging and forestry material handling equipment - the 718M E series multi-functional tree handling machine. This innovative, purpose-built machine is designed to cut and stack timber 10 times faster than the most aggressive conventional methods. Changeable head attachments means one machine for multiple duties, including a grapple saw, mulcher, mower, stump grinder, and tree cutting shear. The 718M E series is designed to address multiple tree service industries. The compact and agile machine is equipped with a boom and a telescopic stick for efficient dismantling, removal, and stacking of structurally damaged or fallen trees after major storm events. Other applications for the 718M E series include right-of-way clearing, utility line maintenance, residential/commercial land development and municipal road maintenance. 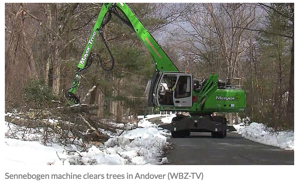 During a recent series of Nor'easter events in Boston, the Mayer Tree company brought in the 718M E series tree handling machine to quickly clear fallen trees before the next major event would arrive. To make the situation even worse, the downed trees were blocking snow plows and emergency vehicle access to residents without power and those stranded in the blizzard. Using the grapple saw attachment to cut and handle trees, the crew was able to clear major roadways and access points 10 times faster than usual. The 718M E series has a compact footprint for easy transport and roadside operation. But the tough undercarriage is equipped with reinforced axles and off road tires for stability on demanding terrain. During bad weather and at night, the single-operator 718M E series keeps going - cutting and collecting trees and removing large areas of debris and vegetation in a fraction of the time. With a lifting capacity of 12,000 lbs when fully extended vertically (48 foot reach) and 3,700 lbs when fully extended horizontally (43 foot reach), this equipment makes easy work of tall and thick trees alike. The dangerously lethal duties that are a part of clearing storm ravaged trees from urban and natural landscapes can now be relegated to the 718M E series tree handling machine. Onsite accidents and fatalities are drastically reduced, along with property damage liability issues and the OSHA-related consequences that result. In the same way the farming industry transitioned from manual labor to simple hydraulic-powered equipment to today's high functioning, multi-tasking agricultural machinery - the 718M E series tree handler is set to revolutionize the arbor industry. SENNEBOGEN has made careful consideration to design this machine with operator comfort in mind. Full visibility with large front and side windows, right side and rear view camera systems, and an auto-climate controlled interior with heated seats are meant to make the operator comfortable and confident while working. The company maintains a world class training center at its Stanley, NC headquarters, along with 250 other service locations and 45 dealers.